It’s been exciting, starting to work with KIDS FIRST! a few weeks ago as newsletter editor. I’ve had the pleasure of working with Ranny Levy and Ann Church for several years through KIDS FIRST!’s association with Moving Pictures, a publication where I also ply my pen and red pencil as a writer/editor. My career in journalism began during my earlier career as a teacher. I had the opportunity to be involved with the development of a language arts enrichment program that mixed literature, drama and art — and my rendition of Jewish folktale “It Could Be Worse” was one of the series of books distributed through Amazon.com. Not long after completing that project, I became managing editor and lead writer for a start-up local lifestyle magazine. I founded my company, Grammar & Glitz Inc., in 2002, and have taken writing and editing gigs with corporations and publications nationwide. The pleasure is all mine as I continually get to explore a wide variety of subjects and meet a diversity of wonderful people. Quality programming and arts resonate especially strongly with me. With extensive community service involvement over the years in youth organizations, I currently focus my efforts on Rosie’s House: A Music Academy for Children. I’ve served many years on the board of directors of this nonprofit that provides instruments and free, professional music instruction to the underserved youth of Phoenix. If Tom and Jerry Meet Sherlock Holmes is the movie your child wants to review for the KIDS FIRST! Film Critics’ Search competition, then today is the day you’ve been waiting for. Ideal for 6- to 12-year-olds, Tom and Jerry Meet Sherlock Holmes streets today. And thanks to these two competition sponsors, the Warner Home Video DVD is readily available in-store at Toys “R” Us (on the special KIDS FIRST! Film Critics Search endcap display) and online at Amazon.com. Academy Award-winning cartoon cat and mouse duo Tom and Jerry take their trademark antics and mayhem to London, where they help the legendary Sherlock Holmes and his helper Dr. Watson crack the burglary case that has befuddled Scotland Yard: A beautiful singer is being framed for jewel heists in the city of London in this first Tom and Jerry direct-to-video film to be produced without its original creators William Hanna and Joseph Barbera. Featured voices include film notables Malcolm McDowell, whose acting career spans the sci-fi/drama/thriller A Clockwork Orange (1971), for which he earned a Golden Globe nomination, to this year’s comedy Barry Munday; Michael York, whose similarly extensive and varied filmography includes voicing characters in 1997’s A Christmas Carol and current TV show “Family Guy”; and John Rhys-Davies, who has such action-blockbuster franchises as Indiana Jones and The Lord of the Rings on his long list of credits. KIDS FIRST! has prepared a special discussion guide to help our budding reviewers. Among the talking points for parents to share with their kids are questions about this Sherlock Holmes-ian story that go to details of the plot (Name some of the clues Jerry found and discuss how they led him to the three cats as suspects for the stolen jewel) and others that focus on the relationship between favorite characters Tom and Jerry (How do Tom and Jerry, whose rivalry is recognized as one of the most famous and longest-lived in American film, treat each other in this movie?). To enter the KIDS FIRST! Film Critics’ Search — which offers kids aged six to 15 the chance to be one of five KIDS FIRST! film reviewers, enjoying a year of attending red carpet events and reviewing films for our website and those of our partners — the first step is to send in a written review by October 10. KIDS FIRST! will then send the applicants instructions for creating a videotaped review. The video entries will be posted on WonderWorldTV.com for public vote, so tell all your friends. And be sure to vote yourself! Winners of the KIDS FIRST! Film Critics’ Search will be announced the weekend of Nov. 12 – 14. The weekend’s exciting festivities will also include a unique KIDS FIRST! first: We will attempt to set a world’s record of one million kids and a caring adult “viewing and reviewing” a single film (The Velveteen Rabbit). Mark your calendar to share the event with us. 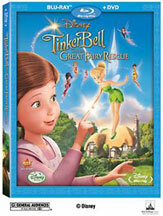 Walt Disney’s beloved fairy Tinker Bell flits off to a new adventure in Tinker Bell and the Great Fairy Rescue. Streeting on DVD next month, September 21, the movie will have a special advance screening on the big screen this weekend, August 21 and 22. KIDS FIRST! and Walt Disney Home Entertainment are bringing Tinker Bell and the Great Fairy Rescue to theaters in select cities across the United States. Visit kidsfirst.org/filmfestival/TinkerBellScreening for a list of locations and to print the KIDS FIRST! passes. Screenings are free, but please plan to be early as seating is strictly first come, first served. Cooperation is key as Tinker Bell must team up with a rival fairy to keep humans from finding out they exist. Mae Whitman as the voice of Tinker Bell reprises her role from last year’s Tinker Bell and the Lost Treasure and the previous year’s Tinker Bell, along with Kristin Chenoweth and Lucy Liu as Rosetta and Silvermist, respectively. Michael Sheen (who voiced the White Rabbit in Disney’s recent theatrical release Alice in Wonderland) adds a new voice to the animated cast as Dr. Griffith. And the wait is over for Furry Vengeance — the DVD streets today. Especially appropriate for kids aged five to 12, Furry Vengeance is one of the seven titles in the KIDS FIRST! Film Critics’ Search competition. The fur flies in this film as the forest creatures prove more than a match for a real estate developer (Brendan Fraser) looking to turn their habitat into a housing development. We’ll soon be adding the discussion guide for Furry Vengeance to our website, to enhance your after-viewing discussions and to help your child prepare his or her entry for the KIDS FIRST! Film Critics’ Search. Five fortunate film-loving kids (age six to 15) will ultimately be chosen a KIDS FIRST! film critic for one year, to attend previews and red carpet events and write reviews for KIDS FIRST! and our media partners. The first step is to submit a written review (of Furry Vengeance or one of the other six titles) by October 10. Entrants will then be invited to submit a videotaped review by October 20 – and we’ll send you instructions on how to create the video. Winners will be announced the weekend of Nov. 12 – 14, as the KIDS FIRST! Film Critics’ Search culminates with a unique event: We will attempt to set a world’s record of one million kids “viewing and reviewing” the same movie (The Velveteen Rabbit) at the same time. Mark your calendar now to take part in this special occasion. And watch the WonderWorld website, where you and your friends can view the KIDS FIRST! Film Critics’ Search video entries and cast your vote for the winner. DVDs of KIDS FIRST! Film Critics’ Search selections are standing pretty at Toys”R”Us. The retail giant for children’s clothing, furniture and more, a sponsor of the KIDS FIRST! Film Critics’ Search Campaign this inaugural year, is helping spread the word to eligible kids by giving the display prominent position on their new release endcap display. Four of the contest titles are readily available now to add to your family collection: Diary of a Wimpy Kid, The Twilight Saga: New Moon, Furry Vengeance and The Velveteen Rabbit. And watch for the Toys”R”Us emailed circular this weekend — promoting a 25 percent savings on these DVDs when purchased in the store. Tom and Jerry Meet Sherlock Holmes will be available on August 24th. Amazon is adding its punch to the program with promotion of the KIDS FIRST! Film Critics’ Search Campaign as part of its Kids & Family page and in its blog and Facebook page. This is all helping to bring us closer to the knock-out conclusion we’re planning for the final weekend of the KIDS FIRST! Film Critics’ Search, Nov. 12 – 14. That’s the weekend we will announce the names of the five kids chosen to be KIDS FIRST! Film Critics for one year, attending special events (including red carpet premieres for movies), interviewing the stars and writing reviews of the films for KIDS FIRST! and our media partners. It is during that weekend we will attempt to set a world’s record of one million kids “viewing and reviewing” the same film on the same weekend by encouraging kids and a caring adult to enjoy The Velveteen Rabbit together. The competition is ongoing right now. Kids ages six to 15 have until October 10 to submit a written review, and until October 20 to submit their videotaped review. The video reviews will be posted on KIDS FIRST!’s partner site, WonderWorldTV.com, where the public will vote on the reviews and narrow the field to 20 finalists. The five winners will then be chosen by a panel of celebrity judges. And parents — this is not only a fun activity to share with your child, but it’s educationally sound. With visual media such a pervasive element of contemporary life, we’ve developed our KIDS FIRST! Film Critics’ Campaign to encourage an active rather than passive response — a vital visual literacy whereby kids learn to critique as well as write reviews about media they enjoy. Use our discussion guides (we’ve prepared one specifically for each of the competition’s selected films) to enhance your child’s appreciation of the film as well as to help her or him work up an insightful review. Just click on the DVD title on the right side of the KIDS FIRST! Film Critics’ Search page, and it will take you to the film’s information page and discussion guide. You can support KIDS FIRST! directly by purchasing the Director’s Cut of The Velveteen Rabbit directly from SteppingStones.com. 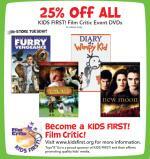 A portion of your purchase will be donated to KIDS FIRST!, supporting the Film Critics’ Campaign. 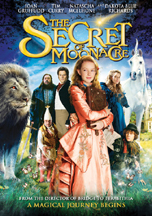 If The Secret of Moonacre is the film you’ve chosen to review for the KIDS FIRST! Film Critics’ Search competition – or if you just want to enjoy it on the big screen before buying the DVD for your home collection – you may be in luck. On Aug. 12, Screenvision is presenting it in select theaters throughout the United States. The special screening is currently planned for 150 markets, with more possibly coming online. For a complete list of locations and to order tickets, please visit www.screenvision.com/s/showing/SecretOfMoonacre. The film, adapted from Elizabeth Goudge’s novel The Little White Horse, follows the fantastical adventures of a newly orphaned 13-year-old who discovers a magical, moonlit world when she goes to live with her eccentric uncle at his aptly named Moonacre Manor. The mysterious environs are a huge change from the luxury she’d known in London, but Maria Merryweather (played by Dakota Blue Richards, The Golden Compass) suffers a bigger shock when she learns that the task of saving Moonacre Manor from an ancient curse rests on her young shoulders. The story offers a safe context for parents to discuss with their children (8-12 is the ideal age for this film) several topics that may otherwise be too hard or scary to express: Who would take care of you if something happened to your parents? What would you do if, instead of your family taking care of you, you found it was you who had to save your family? And in the story, Maria’s uncle (played by the wonderful Ioan Gruffudd, whose film credits include Fantastic Four) treats her dreadfully – opening up the question of why a tragedy can affect someone’s behavior. These are among the talking points developed in the KIDS FIRST! Film Critics Discussion Guide. KIDS FIRST! has developed a specific discussion guide for each of the seven films that are part of the KIDS FIRST! Film Critics’ Search for kids aged six to 15. The first step to enter is to send in a written review by October 10, and KIDS FIRST! will send the applicants instructions for creating a videotaped review that will then be posted on WonderWorldTV.com for public vote. We encourage everyone to vote! Winners of the KIDS FIRST! Film Critics’ Search will be announced the weekend of Nov. 12 – 14, with festivities that will include the excitement of KIDS FIRST!’s attempt to set a world’s record of one million kids “viewing and reviewing” a single film (The Velveteen Rabbit) with a caring adult. You are currently browsing the KIDS FIRST! News weblog archives for August, 2010.